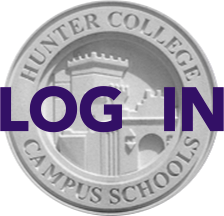 Hunter Opens Its Doors to Parents Today, Tuesday, September 30! Take advantage of a once-a-year opportunity to sit in on your child's classes! There is no formal program, just a chance to experience the Hunter school day firsthand. You can attend one class or the entire day. Click on "read more" to read some important reminders from Principal Tony Fisher. "This is your opportunity to visit classes and meet teachers; all of our teachers are eager to have you come in and to see how their classes operate. Because many classes do not meet every day, especially in the seventh and eighth grades, there may some classes you do not get to visit; however, I do hope that you will be able to come in for some length of time to see the school and to get a feel for your child's daily existence! Since this is a "regular" day of classes, I would ask that when you join the classes, please turn off cell phones, etc. ; also, taking pictures/ recording/ videotaping is prohibited. In addition, note that this is not a day when teachers will be able to discuss individual students; parent-teacher conferences will occur in November (more on that at a later date). I also encourage you to stop by the G. O. Club Open House, which will run in the Auditorium during 4th period, Activities and 5th period. The Open House gives students and parents a chance to see the wide variety of extracurricular activities that are available at Hunter."